HydroTops Bioponic Coco Grow A&B is a concentrated nutrients formula developed to meet the needs of flowering and fruit bearing plants grown in Coco Coir during the vegetative stage of the cultivation cycle. During this phase of the growth cycle plants build the necessary foundations to produce an abundant harvest. Attention to the nutritional balance supplied during the grow period is essential. 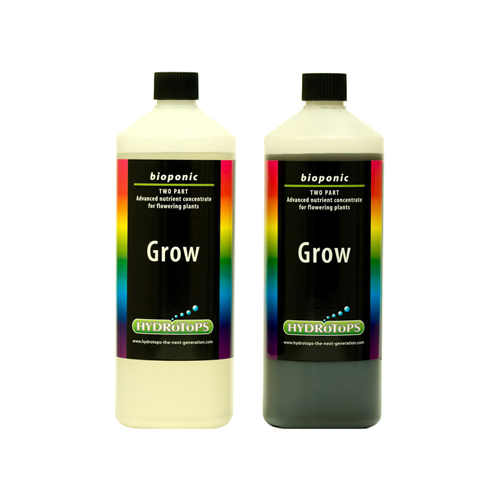 HydroTops Bioponic Grow has been developed to encourage maximum nutrient assimilation since during the growth phase larger nutrient uptake relates directly to increased yields when harvesting. 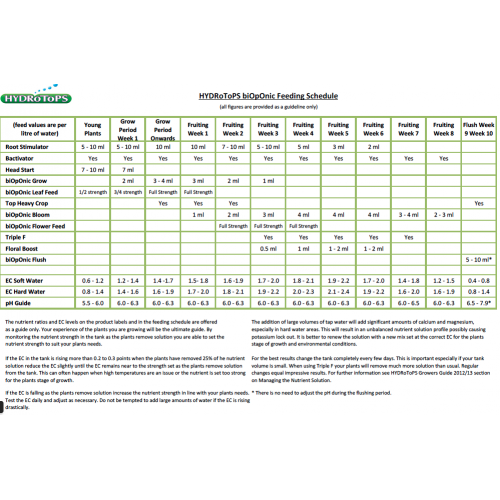 Growers using Top Heavy Crop as part of the complete growing schedule will see amazing growth and vigour, shortening the period required for vegetative growth whilst maintaining yields. Using Top Heavy Crop will seriously increase the number of flowering sites. Rate of use is 3 - 4ml of both A & B to each litre of water. With young plants mix with Head Start to gradually increase your EC moving to Bioponic Grow once your plants are fully established.